can I decide another day? : Spooktastic Friday! On a Friday that a holiday falls on, I feel like 5 just isn't enough. Ok.. annnndd Britt tagged me to answer some Halloween themed questions, and since I had nothing else planned... I felt like this would work out nicely. Uhhhh, Coraline? This is the part where I tell you that I don't watch horror movies. I have this problem when I get scared that I cry. It's really unpleasant so I just avoid them altogether. If you were in a horror movie how far do you think you would get? I'd be the person that died after the child or the black person. My group would be pleased that I got knocked off because I'd just make a series of poor life choices and I'm not a very fast runner. They make scary video games? I'm going back under my rock. "The one where you're pregnant," per Mr. Mystery. He called that one. I was just gonna say one of the NC ghost stories. One year when I was in elementary school, there was a slumber party at my house and Teh Mom read us NC ghost stories. I'm sure that if I tried to remember my "favorite" I'd blend several stories together, so we'll just bypass that. What's one unusual thing you're afraid of? Hair. It's not really a fear, it's an extreme intolerance. I absolutely LOATHE hair on me or in my face, particularly loose hairs. I've been known to pick hairs off of strangers. One normal thing I'm scared of is spiders... but I'm unusually afraid of them if I'm shoeless, because that means I'm completely defenseless against them. The absolute worst is when I step out of the shower and see a spider. THE WORST. What's your first memory of Halloween? 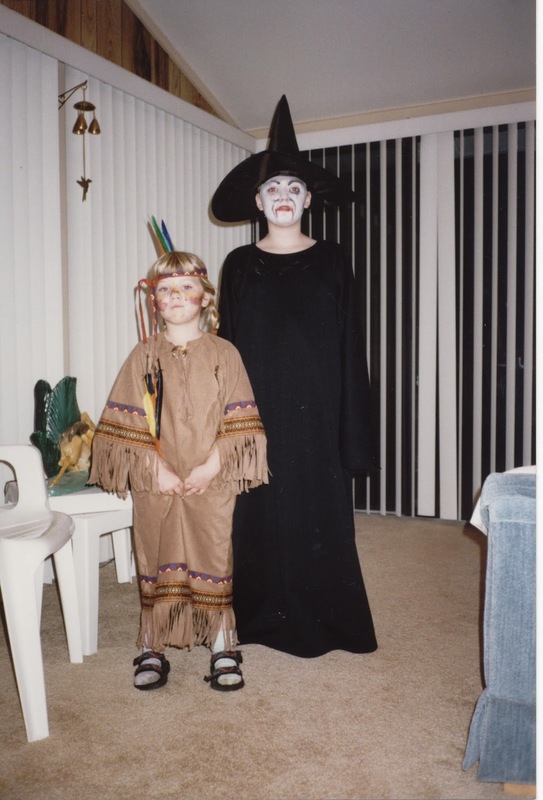 I'm not sure which halloween it was, because I have no idea what I was dressed as. All I remember was going to one of the neighborhoods close by and the streets being a slow moving caterpillar of cars distributing children at houses along the houses with porch lights on. After we finished going through that neighborhood, Teh Mom took us to "the nice" neighborhood so we got "the good" candy. What your favorite Halloween memory? Last halloween was the first halloween where there were actually trick-or-treaters that came to my house. The best part was when they would knock or ring the doorbell and since I had a storm door, I had the front door open. I would let Phil greet all the visitors. Which was fine.. until I heard screams of children... I thought that maybe Phil had gotten out.. no no.. Phil had just ran to the door and beat me like he had several times before, but these teenagers were afraid of him. So they ran away to the neighbor's house. I had to literally bribe them with candy to get them to come back. I did have the kids that ran away pet Phil so they realized he wasn't scary. If my sweatshirt arrives in time, it will be this year, when I'm Thing 2 because actual blue hair and minimal effort for a costume? WIN. If it doesn't, then my Shitbag Booter will be my best costume. I just looked and apparently I didn't blog about Halloween in Bahrain. Megan Fail. Anyways, I went as a "Shitbag Booter" meaning a person who doesn't follow regulations who just got out of bootcamp. I wore a set of utilities since it was a phased out navy uniform and because I had it around and I didn't have to purchase anything. I removed the name tapes and the U.S. Navy tape so it was really more like prison garb. I used masking tape for a name tag and branch tag. My name was: Shitbag on my chest and Booter on my pants. For my branch, I put "Global Force for Good". I put on makeup that was FARRR from natural looking, I wore out of reg earrings, I buttoned my shirt crooked and left it untucked, I wore flipflops instead of boots, I painted my fingernails a NOT complementary color to my skin tone, and I didn't wear a cover at all. What's your worst Halloween costume? Werewolves are SUUPPPPER hairy and I have the hair thing.. so I'm going to say the hairy monster. Zombies. Ghosts seem irritating mostly. Creepy Dolls or Creepy Clowns? Clowns, because they are supposed to be funny... but they aren't. Freddy Kruger, Jason Voorhees, Michael Meyers, or Leatherface? Uhhh.. Hannibal. Duh. He looks perfectly normal but will eat your brain. And I have no idea who any of these names are and while Britt looked them up, I'm not going to. I assume that one of them is the hockey mask guy and that Leatherface has a gnarly lookin' face. Happy Halloween and Happy Friday, Gentle Readers! Mike had to stop playing a video game because it was too scary. Yeah, they exist. I hadn't seen the Halloween in Bahrain picture. What an amazing costume! I don't watch horror movies, either. No reason to. And as for who I'd be in a horror movie, I'd be the person that gets killed first because I definitely don't run and certainly couldn't outrun sometime trying to murder me. nooooo.....i don't watch or like horror films either. this is the worst time of year for me, tv-wise, since commercials are all filled with horror things/movies so i never know when a scary commercial will appear! I love that none of my bloggy friends who did this actually watch horror movies. Clearly, I stick with my own kind.